It was a very happy birthday for the Tellico Village Wellness Center on October 13th. Over 500 Tellico Villagers celebrated the milestone while enjoying festivities at the 2nd Annual Fall Fest. The glorious day had more than 40 vendors on hand sharing their organizations and social club opportunities at one of the best places to live in Tennessee. The celebration featured live entertainment by the Holloway Sisters, a dunking booth, complimentary lunch from Dixie Pig BBQ and free homemade ice cream, all on a beautiful Fall day overlooking sparkling Tellico Lake with the majestic Great Smoky Mountains in the backdrop. Real Estate Scorecard has always been impressed with the state-of-the-art Tellico Village Wellness Center, a 27,000 square foot facility with an indoor 6-lane/25 yard heated swimming pool and smaller warm water therapy pool kept 95 degrees, where water aerobics classes take place in the pool almost every day of the year. Its bright and cheery 6,000 square foot exercise room has high vaulted ceilings, sunny windows and dozens of weight and cardio machines, and free weights along with a low impact rubber-padded walking track around the circumference of the fitness room. The Wellness Center is also equipped with well appointed men’s and women’s locker rooms and dry saunas, as well as a spacious fitness class studio that offers a wide variety of dance and movement classes, yoga, and Tai Chi. 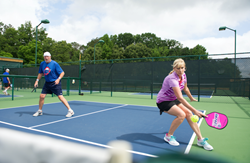 Outside the center members have more sports amenities to get their heartbeat up which include 4 Har-Tru tennis courts, 8 pickleball courts and another fitness walking track. The cost of membership is super affordable, at around $30 a month for an individual. The Tellico Village Wellness Center is one of three fitness centers in the village. Tellico Village Farmer’s Market (Wednesday’s from March - October) Residents can purchase organic produce and vegetables, honey, flowers, handmade soaps and plants right within the neighborhood. Lake Day (beginning of the summer) A kickoff to summer where there are boat manufacturers and other water activities and service reps in attendance. It is held at the marina at the Yacht Club. Tellico Village began development in the late 1980’s. It is a huge master planned community on the shoreline of Tellico Lake, one of the cleanest lakes in Tennessee. A navigable lake that can take one all the way to the Gulf of Mexico via the lock system. Approximately 4,000 homes have been built to date of 7,200 planned. Property owners love living here. In fact, Tellico Village is one of the highest scoring communities on our website with 1,799 property owners scoring it a 97 out of 100 according to Real Estate Scorecard. Buyers searching for waterfront retirement communities will find it virtually impossible to find anywhere like the village. Although the community has three 18 hole championship golf courses, membership is completely optional. Additional amenities include a lakefront yacht club, marina, restaurants, community parks and even a library. Knowing the village has attracted a large retirement population, the community continues to be proactive in attracting aging in place assistance. This includes having medical care onsite and an assisted living facility. This includes the new Summit Medical Group primary care clinic and The Neighborhood at Tellico Village, a charming, comfortably furnished senior living community offering assisted living apartments, Five Star’s award-winning Bridge to Rediscovery Alzheimer’s care program, and respite/short stay with highly skilled 24-hour staff provides friendly and compassionate services individualized to each resident’s specific needs. If fitness and wellbeing are an important part of one's daily life and for folks looking for super friendly places to live in Tennessee, don’t miss touring Tellico Village. Take advantage of their Discovery Package which provides a close up look and experience.